Amy Grant is a Grammy Award- and Dove Award-winning singer-songwriter who is considered one of the most influential figures in contemporary Christian music. She was the first Christian music artist to have a platinum record, and her work has transcended genres over her 40-year career. A Nashville, Tenn., native, Grant is known for songwriting that’s honest and vulnerable, as well as for her philanthropy. 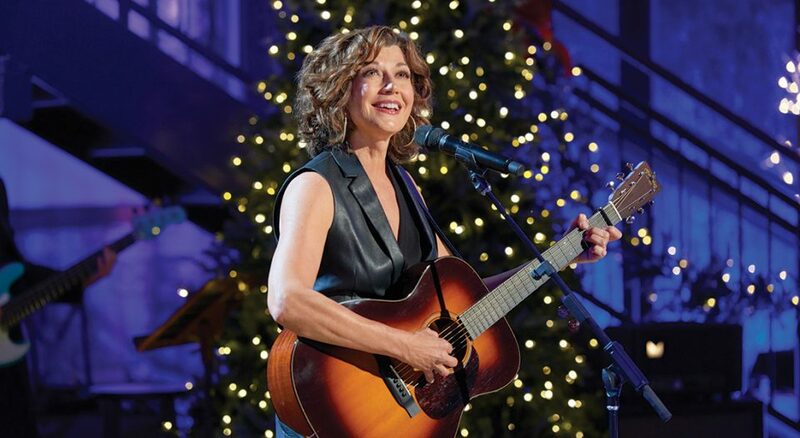 Continuing her history of releasing Advent and Christmas music, Grant’s new TV special, Amy Grant’s Tennessee Christmas, airs Dec. 3 on the Hallmark Channel. Living Lutheran spoke with Grant about her upcoming special, the complexities of the Christmas season and the messages of hope her faith brings to her music. Living Lutheran: In addition to music, your Christmas special features real-life stories of volunteering and community service. What made you want to do the special now, and how did you decide on that approach? Grant: For the last 30-plus years, I’ve recorded and performed Christmas music. … I love touring at Christmastime, but this year the last of our blended family of five children is a senior in high school so I just didn’t want to be on the road at Christmastime. Hallmark reached out to me to do a Christmas project, and I thought, “Why don’t we do a TV special?” I invited some guests—Kellie Pickler, Michael W. Smith and my husband, Vince Gill. They’re part of the concert. [The special] is a combination of music and, since Tennessee is [known as] “The Volunteer State,” I thought, “Why don’t we tell stories of people who are volunteering and how that’s enhanced their lives?” When you think about Christmas, giving is a big component, and it doesn’t require a big bank account to volunteer. Your Christmas albums are beloved by people across many backgrounds. What do you enjoy about returning to Advent and Christmas music, and how has your approach changed over the years? Singing “O Come, All Ye Faithful” always feels like a combination of the good news of “peace on earth, good will toward men, glory to God in the highest.” Also, because my family is such an anchor for me, I felt like with every Christmas song I recorded, I was returning to my roots. And my family’s not perfect; people are messy, and that’s influenced my songwriting. Just from my sisters—there are four of us—on down, there are 50 of us. In a big family, there’s a little bit of everything. Somebody is always at the top of their game and somebody is barely hanging on. As time has gone on, I want my music to reflect that because hope is most appreciated by those of us who feel the depth of our need. I love “Rocking Around the Christmas Tree,” but I know in the midst of that, I can have a song like “Breath of Heaven.” Even though it’s a song that’s specifically trying to capture Mary’s experience, who in the world doesn’t have that feeling of being completely overwhelmed by life? And in the course of that song, I now have a prayer to sing. To me, that’s the gift of music—any art really. Art helps us articulate the human experience and connects us to God. To me, that’s the gift of music—any art really. Art helps us articulate the human experience and connects us to God. How has your faith informed your approach to music, and how has that changed over the years? Understanding that the value of every human being is the same in God’s eyes. We all matter. We’re all loved. I think that affects any person of faith—how you carry yourself, how you handle what happens to you. There’s always a much bigger story that I’m a small part of. All of that finds its way into songwriting. I’ve written some really sad songs when I’m heart­broken, and I didn’t want to tie them up with a neat bow. But do I think there’s any situation that’s ultimately hopeless? No. It does affect my songwriting to know there are always many levels of experience, intention and result for every situation in life. Nothing is what it looks like on first glance. You’ve written extensively about grace (e.g., “Don’t Try So Hard”), an especially meaningful concept to Lutherans. Why is that message an important one for you to share? Oh, my goodness. Understanding grace is the lynchpin. If you don’t understand grace, then all the pressure is on performance, and nobody is that good. What message do you hope to convey to people through your Christmas music during this season? Always the message that we are loved by God. For God so loved the world, he gave his son. And all are welcome at the table. On a practical level, I know what it feels like being part of a family and being a wife and a mom. Sometimes life is so hurried and there are so many details we have to attend to individually. Sometimes I long for the simplicity of earlier times when our lives weren’t so fragmented. When I put a concert together or this TV special, I have a small chunk of time that someone might trust me with their attention, so I’m going to try to give them what I long for—that feeling of a sense of connection, a celebration of meaning. One of the songs on your first Christmas collection (A Christmas Album, 1983) is “A Mighty Fortress.” Written by Martin Luther, it’s an important hymn in the Lutheran tradition. What made you want to include it? It’s a significant life hymn. I loved not singing it; I loved that it was the horn section doing it. For someone that it’s familiar to, not having the words sung makes you supply the words inside. And I think the spirit and intention of the song is [such] that even someone who has never heard it before can still be affected by the music. It’s grounding and the performance is majestic. I love that song. Christmas can be a season of great joy and celebration for some, and many of your songs echo this. But you do have some songs, particularly on Tennessee Christmas (2016), that speak to those for whom this time of year can be difficult. Why was it important to record those songs? Life is hard and sadness comes to all of us. With my most recent Christmas record, I wanted to be very intentional about singing songs that could find somebody who’s in a hard place, an isolated place, and speak to them. My husband wrote a song the Christmas after his brother died called “It Won’t Be the Same This Year,” and I love it when he sings that song because death is painful, but it’s as natural and normal as birth. Someone is the first to go and somebody’s left behind. The collective sadness and longing of life, that is a lot. So how great, even at Christmas, to say this is really life—all of it—the longing, the hope. Dancing side-by-side like they were meant to. Brandsrud is an associate editor of Living Lutheran.